Here is the new 12th pass Govt jobs opportunity for clerk job profile. Sardarkrushinagar Dantiwada Agricultural University in Gujarat State is looking to recruit fresher candidates for Clerk Job profile. There are total 247 vacant positions of clerk which are going to be filled up through this SADAU Recruitment 2019. We took this information from the official website of SADAU Department whose link is as follow: “http://www.sdau.edu.in”. SADAU Recruitment department published official PDF file on this website related to this Clerk recruitment process 2019. At the last of this article we also shared the official PDF file link under IMPORTANT LINK section. 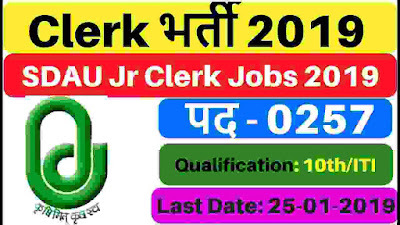 So those who want to apply these 12th pass Govt jobs in India 2019 for clerk posts have to read that PDF file very carefully or this article before applying. The official PDF file is in Gujarati language only. Number of Vacancies: 247 Posts. Pay Band: Rs.19,900 -Rs.63,200 Per Month. Education Requirement: Applicant should have passed H.S.C. that means 12th pass in any stream. (or) its equivalent examination and Should possess the speed in Gujarati typing 25 words per minute OR English Typing 40 words per minute and Passed the Examination of CCC of DOEACC or of the equivalent level examination. Those who lies in between this age criteria can apply for these 12th pass Govt jobs in India 2019. Paying Method: You can pay the above examination fee structure through Online method as well as with Bank Challan. 25th Jan. 2019 is the Last Date to apply.